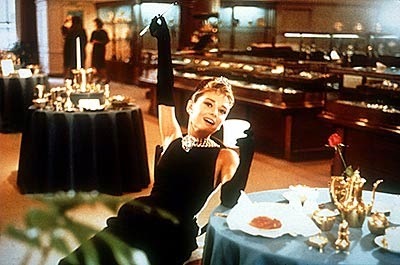 However, we can create a sparkling setting inspired by Tiffany & Co. Jewelers for Mom! a gift from a very special friend. you can read more about that on my personal blog if you'd like to. 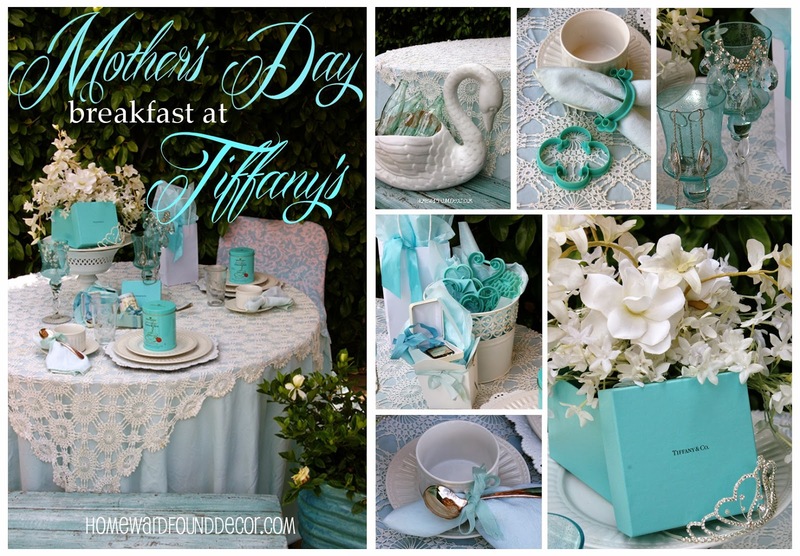 to create a lovely setting for a Mother's Day brunch to share with you. shines against the contrast of a deep green vine wall in the garden. and layered vintage linens bring to mind white clouds against a blue sky. you'll see the 'how-to' for it in an upcoming Summer post! on a white ceramic pedestal topped with a plate to add height to the tablescape. when that Snowman didn't sell, I took it off and kept the base. two are necklaces, one is a tree ornament. and also makes the glass holders easier to keep clean. is simply topped with a take-home gift of an aqua blue container of loose-leaf tea. along with a stirring spoon tied with a pretty ribbon. The napkin holders in the second image above are plastic cookie cutters. And you know I love using cookie cutters for MUCH more than making cookies! and also tied a few to blue ribbons along with crystals, and suspended them from the vine wall. If there had been a chandelier overhead, I would have hung them from it... with more crystals. Of course, the gifts for Mom are color-coordinated to the setting! and become part of the decor. and the china cup belonged to my grandma Rissia when she was a girl. This fragrant gardenia bloom is in honor of my Grandma Margie Ward. It was her favorite flower...and the scent makes me stop in my tracks and think of her. A ceramic swan planter (that used to be peach - ugh!) holds ice and small bottled beverages. Vintage bottles make perfect single-bloom vases, and can be taken home by guests. to create a special event for your Mom! Not a blue person but this looks so nice. And love the wine glasses. We have been going to San Antonio Winery for decades..and was going next week to buy 2 cases for a 80th party. Now I think some of these glasses will come home with me too! Thanks for sharing the beautiful table setting.